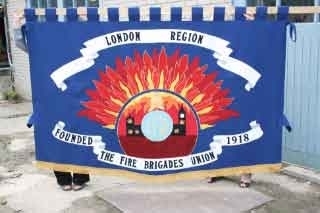 The Fire Brigades Union (FBU) has vowed to mobilise every firefighter at every fire station to defend London’s fire service, after fire authority politicians decided to comply with an order by the mayor of London, Boris Johnson, for public consultation to begin on proposals to close 12 fire stations, remove 18 engines and slash 520 frontline firefighter posts. With the London Fire and Emergency Planning Authority (LFEPA) already having defied the mayor’s order on two occasions, a meeting of the authority’s urgency committee agreed this afternoon to give the go-ahead to the consultation. This came after the mayor threatened court action. However, the urgency committee agreed significant changes to the format of the consultation, and further agreed that the cuts would not be implemented during 2013/14. The consultation will run for 12 weeks, and the union has called for the widest possible campaign to fight the cuts. Regional secretary Paul Embery said: “The starting gun has been fired, and we want Londoners to join with us in defending their fire service. These cuts are reckless and wrong. They would mean nearly five million Londoners across twenty boroughs waiting longer for a fire engine, and that will place people in serious danger. “We need the broadest based campaign which unites all sections of the community in opposition to the mayor. Nobody wants these cuts: not the fire authority, the GLA, the workforce or the community. Even some Conservative councils have come out against the cuts. It’s Boris Johnson versus the rest of London. Funding for Fire Services to be Cut by 25 Per Cent – Unless we Stop It Happening! The Government is seeking to implement what it is calling “a fairer funding settlement across Fire and Rescue Services” for the period 2013 – 17. In the Spending Review 2010 the government reduced the formula grant funding for Fire and Rescue Authorities by 5.8 per cent in 2010-11 and a further 0.7 per cent in 2012-13. It intends to implement very much larger reductions in 2013-14 and the three subsequent years, in total, making a 25 per cent reduction in funding. That is not ‘fair funding’, it is a massive cut and it will cost lives. The cuts are not distributed equally. Metropolitan Authorities have had an above average cut in grant funding. Reportedly, Merseyside will have a cut of 30 per cent in 2012-13 and 2013-14 alone. The cuts will impact differentially across the SERTUC region but no county or city will escape. As an example, we have shown the projected budget cuts for the Fire Service in Essex in the table above. You need to be worried about where you live, where you work and where you and your family go to public buildings, such as schools and hospitals. In London Boris Johnson wants to reduce the number of fire fighters by 520, to lose 18 fire-engines and to close 12 fire stations in 2013-2014. We have 12 weeks to express our opposition and mobilise against these cuts. See London FBU Press Release attached. To find out what is happening specifically where you live or work do some quick research, or contact the FBU; see contact details below. These proposed cuts are deeply unpopular with the public, and communities, the FBU and the whole trade union movement can align to stop these cuts and make the government pay the political price for its savage and reckless intentions. 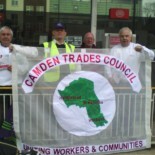 This entry was posted on February 28, 2013 by CAMDEN TRADES COUNCIL.